Over the 28 years that we have been in business, the debate between coated seed and non-coated seed comes up every now and again. So we wanted to take the opportunity to use this debate as a way to educate and provide additional information into why we coat several of our seed blends. We at Antler King offer several seed mixes that are coated and several that are not…we’ll further explain below. Whether you are planting a garden, food plot or are a farmer planting crops for eventual harvest, I would believe that the end result would be to see plants that have germinated, thrived and grown to maturity. All of our seed mixes (both coated and non-coated) are designed for optimum performance, maximum attraction and maximum yield in all conditions and locations. Through several University studies we’ve found that when certain varieties of seed species are coated with a proprietary fertilizer coating; germination is maximized and livability of these coated seeds is over 75% whereas when those same seeds are not coated germination rates decrease and livability is closer to 25% of plants living to maturity. As a result, we choose to encapsulate certain seed blends with our Antler King’s Ultra Coat Orange to increase germination, overall growth and livability (percentage of plants that will reach full maturity) to help insure you will be successful and your deer will be Bigger, Healthier and Happier. On the other hand, we do not coat all of our seed varieties because either they do not respond with such great livability rates or it is too expensive to coat those seed varieties and keep those blends affordable. The process of coating seed is fairly tedious and expensive. In the case of our seed treated in Ultra Coat Orange, each individual seed is encapsulated with a fertilizer coating so that once the seed is planted and moisture (from soil or rain) washes off the coating, the young seedling has fertilizer immediately available, providing an ideal growing environment so that it can start growing and flourishing immediately. The Ultra Coat Orange proprietary fertilizer coating will increase germination, increase survival rate, increase the livability and increase the yield of your food plot, providing better food plots and more food for your deer. As a rule of thumb, we find that smaller seeds such as clover, alfalfa’s and brassicas respond well to coating, whereas larger seeds like peas, wheat, rye and oats do not respond as well. 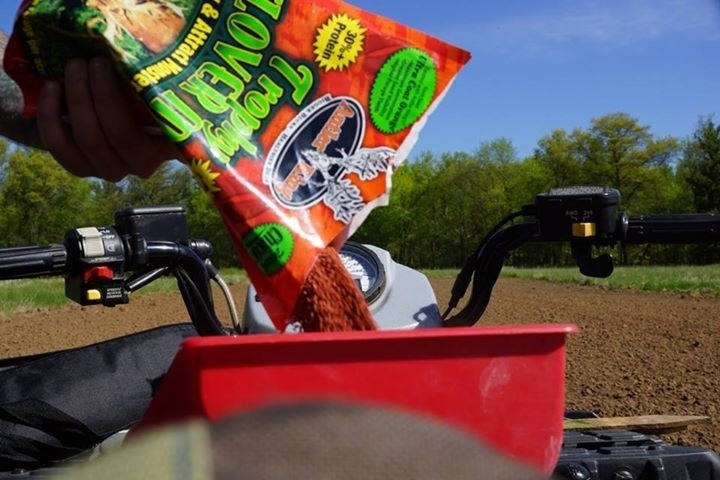 Coating several of our seed blends with Antler King’s Ultra Coat Orange is just another way for us to help you maximize your food plot’s potential, grow thicker, healthier plots and Attract, Grow and Hold more deer on your property. We will continue to work hard to provide you the highest quality products, people and service to help you have a more successful hunting property and hunting season! Todd Stittleburg – Antler King Trophy Products, Inc.
I’m having difficulty growing basil, swisschard, red beets and carrots from seed. I’ve replanted them several times without germination. My transplants are thriving. What’s wrong? Have you been precise on seed depth, pH and using the proper fertilizer? Typically when we see germination issues with plants and Mother Nature has been fairly cooperative the issue is with seeds being planted too deep or pH that is too low to allow the seeds/plants to absorb enough nutrients to grow and thrive.